The 2019 examination will be offered 7 days a week, from Monday, October 14 through Sunday, November 3, 2019. Examinations will be administered via computer-based testing at Prometric Test Centers across the United States. Examinations will also be offered at international Prometric locations; specific international locations to be determined. The specialty examination consists of two components: the core component and a specialty component. These components are split into two separate testing sessions and may be scheduled on the same day or on different days within the examination period. Candidates will receive two scheduling permits, one for the core and one for the specialty examination. Candidates will need to schedule testing times for each exam (core and specialty) at a Prometric testing site. Note that these are separate exams and should not be scheduled at the same time. The questions in the core component cover the basics of Preventive Medicine including epidemiology, biostatistics, environmental health, and health services management and administration; as well as basic content in the three specialty areas of Aerospace Medicine, Occupational Medicine, and Public Health and General Preventive Medicine. The questions in the specialty component pertain specifically to the specialty area. Each component of the examination is scored separately and both components of the examination must be passed to achieve certification. Examinees who fail one component of the examination, may retake just the component that was failed at the next offering of the examination. This policy applies only to the next examination offering; if an examinee does not pass the component at the next examination offering, taking both components of the examination will be required on future attempts. 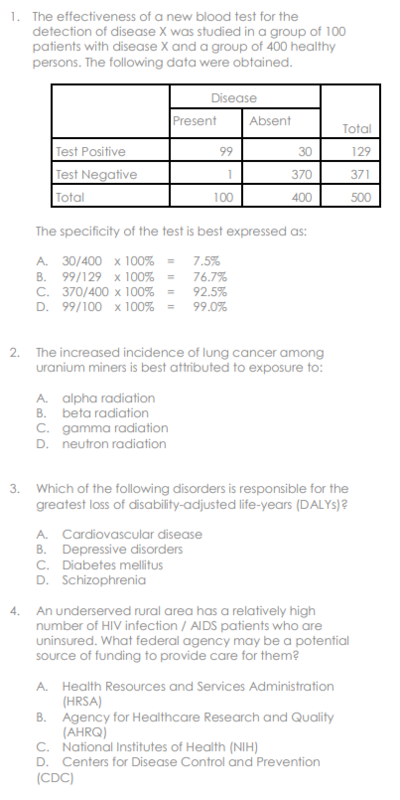 The questions in the subspecialty exam pertain specifically to the subspecialty area. During the defined time to complete the items in each block, you may answer the items in any order, review your responses, and change answers. After you exit the block, or when time expires, you can no longer review test items or change answers in that block. Board examination questions are all multiple choice, best single answer with four or five possible responses. The question may contain a clinical vignette, an experimental or epidemiological observation, a definition or classification, an administrative problem, an application of a principle or regulation, or any situation which might be faced by a specialist in practice. All questions are weighted equally. Candidates will find it of advantage to answer all questions, and there is no penalty for an incorrect answer, i.e., wrong answers are not subtracted from right answers and there is no advantage in leaving a question unanswered. Candidates who are approved to register for an examination may log into their ABPM account to submit registration and payment for the 2019 examination cycle. Examination fees are valid for current examination cycle. Subject to a $500 administrative fee, the examination fee is refundable until midnight (CT) on September 30, 2019. Scheduling for the 2019 examination will be conducted through the National Board of Medical Examiners (NBME) and the Prometric scheduling systems. Unique Candidate Scheduling permits will be sent from NBME, from the following email address, ABPMpermits@nbme.org, up to three (3) weeks after examination payment is received. A copy of the Unique Candidate Scheduling permit is required for admission to the testing area on the day of the scheduled exam, please print a copy for your records. Those who have approved Testing Accommodations will need to call Prometric to schedule the exam. Additional information is available at the Prometric website. The results of the certifying examination will be e-mailed to candidates in early February. Candidates will not be notified by telephone, therefore please do not call the Board office for examination results.